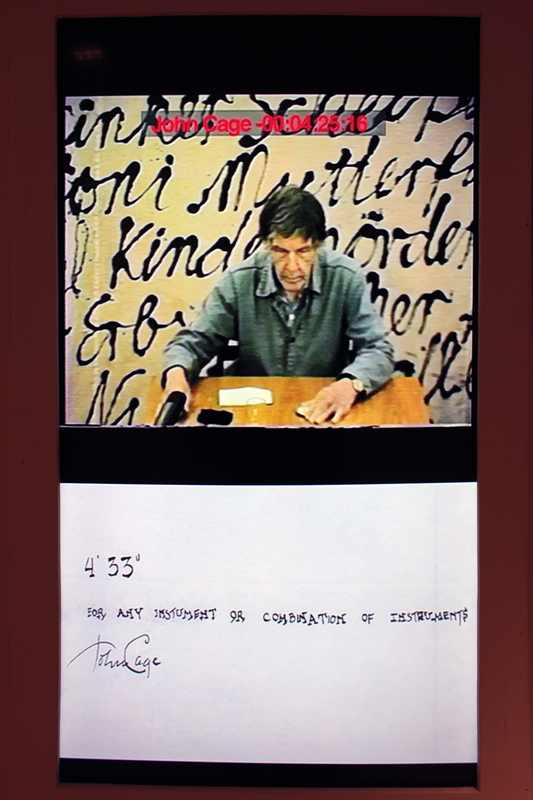 Video documentation by Klaus vom Bruch of John Cage's performance 4'33" at the Kölnischer Kunstverein, Cologne (1986). Courtesy of Klaus vom Bruch. Klaus vom Bruch (Cologne, 1952) is a German media artist. Vom Bruch studied conceptual art at the California Institute of the Arts with John Baldessar from 1975 to 1976, and philosophy at the University of Cologne from 1976 to 1980. With Ulrike Rosenbach and Marcel Odenbach he formed the art group ATV. He works since 1975 with video, first as a videotape and since the mid-1980s especially in installations. His commitment to critical discussions about contemporary events in politics and current social subjects are the sources for his topics. Commercials from TV are often the starting point combined with historical film material which has been alienated and restructured. For the video installations, he included his own sculptural elements, and adopted completely new and characteristic ways. Vom Bruch's early works are compelling inquiries into postwar German identity. The mythic past collides with the media present as the artist is seen in collusion with World War II bomber pilots, wartime destruction, and TV advertising. Collapsing the personal and the historical, conflating subjectivity and history, desire and the cinematic apparatus, or the body and communications technologies, vom Bruch's potent analytical systems expand on the theories of Paul Virilio. The VENICE INTERNATIONAL PERFORMANCE ART WEEK 2016 presents the video documentation by Klaus vom Bruch of John Cage's 1986 performance 4'33", held at the Kölnische Kunstverein, Cologne (DE).